Definition at line 21 of file MipsMCAsmInfo.h. 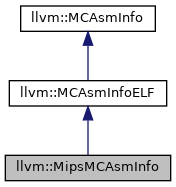 Definition at line 20 of file MipsMCAsmInfo.cpp. 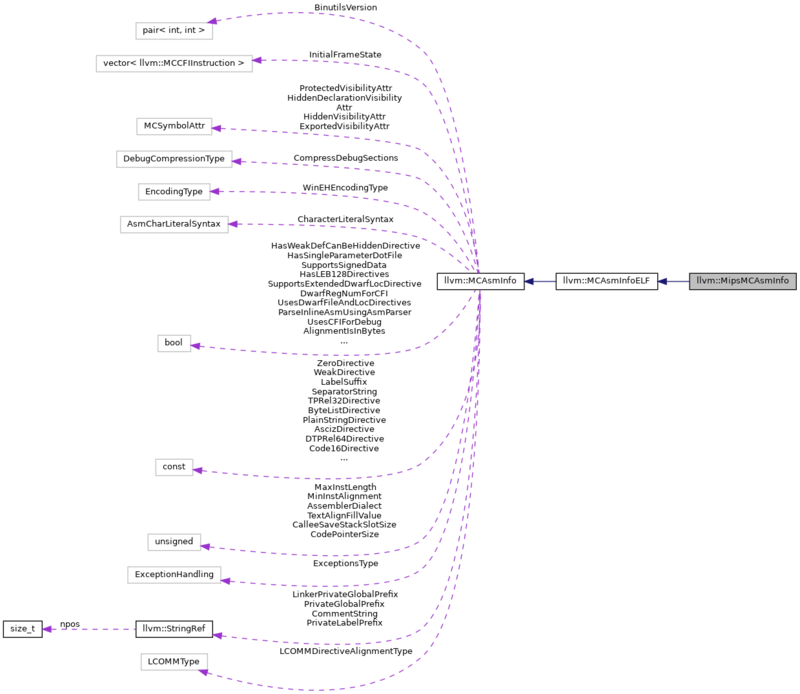 References llvm::MCAsmInfo::AlignmentIsInBytes, llvm::MCAsmInfo::CalleeSaveStackSlotSize, llvm::MCAsmInfo::CodePointerSize, llvm::MCAsmInfo::CommentString, llvm::MCAsmInfo::Data16bitsDirective, llvm::MCAsmInfo::Data32bitsDirective, llvm::MCAsmInfo::Data64bitsDirective, llvm::MCAsmInfo::DTPRel32Directive, llvm::MCAsmInfo::DTPRel64Directive, llvm::DwarfCFI, llvm::MCAsmInfo::DwarfRegNumForCFI, llvm::MCAsmInfo::ExceptionsType, llvm::Triple::getEnvironment(), llvm::Triple::GNUABIN32, llvm::MCAsmInfo::GPRel32Directive, llvm::MCAsmInfo::GPRel64Directive, llvm::MCAsmInfo::HasMipsExpressions, llvm::MCAsmInfo::IsLittleEndian, llvm::Triple::isLittleEndian(), llvm::Triple::isMIPS32(), llvm::Triple::isMIPS64(), llvm::MCAsmInfo::PrivateGlobalPrefix, llvm::MCAsmInfo::PrivateLabelPrefix, llvm::MCAsmInfo::SupportsDebugInformation, llvm::MCAsmInfo::TPRel32Directive, llvm::MCAsmInfo::TPRel64Directive, llvm::MCAsmInfo::UseAssignmentForEHBegin, llvm::MCAsmInfo::UseIntegratedAssembler, and llvm::MCAsmInfo::ZeroDirective.